Whether you’re shopping for a ring for yourself or someone else, it’s important to buy the right size. If the ring is the correct size, it will feel more comfortable and be less likely to fall off. Finding the right size for a ring at home is useful for ordering rings online or shopping for a ring for someone else! 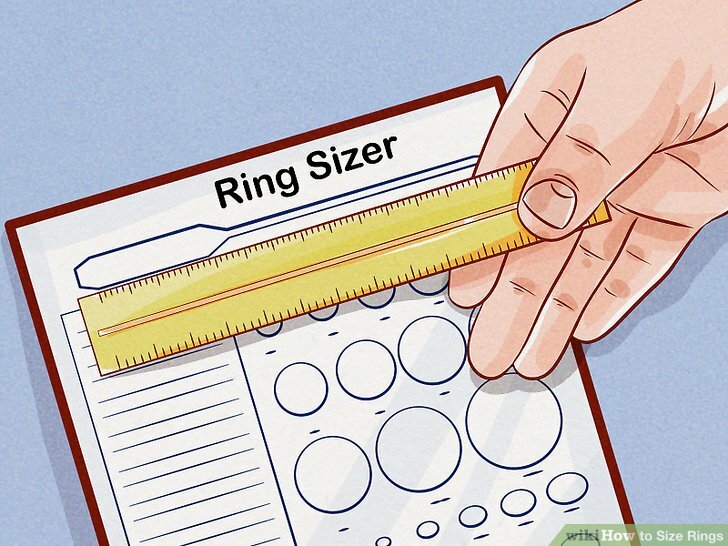 It’s simple to use a printable ring sizer or paper and a ruler to find the right ring size. 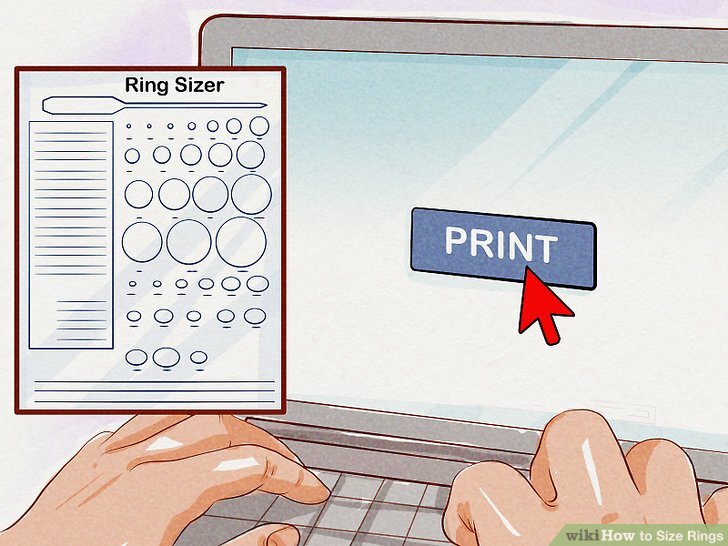 If you’re having trouble getting the page to print, press “control” and “P” at the same time to bring up the print dialogue box. Measure the test bars to ensure accuracy. Once you’ve printed the paper, take a ruler and measure the test bars. To proceed with the process, the ruler must read the exact measurement specified on the page, since ring measurements are very precise. If the test bar is not the right length, try checking your print settings and print the page again. For example, most printable sizers use a general scale of , which roughly converts to a size 6 for USA and U.K. sizing. Choose a ring that you already own that fits well on your finger. Try on a few rings that you already have, and find one that fits well on the finger for which you're buying the ring. It should be snug, but not too tight, and you should be able to put it on and remove it easily. Try moving your arm around with the ring on to make sure it isn’t too loose. 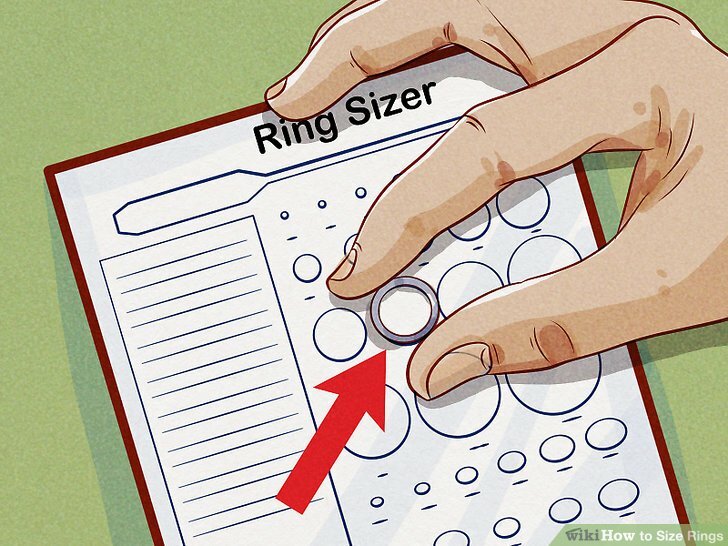 If you don’t have a ring that fits well, try a different method for measuring your ring size. Place the ring that you have over the circles to match the inside edge. Shift the ring around until you find a circle the matches the inside of the ring exactly. This measurement refers to the diameter of the ring, and can translate to different sizes depending on which brand you’re purchasing the ring from. If your ring is in between 2 sizes, it’s best to opt for the larger size to avoid a ring that’s too tight to remove. Cut a long, thin strip out of a piece of paper. Use a piece of printer paper or cardstock for this, since they won’t tear easily. 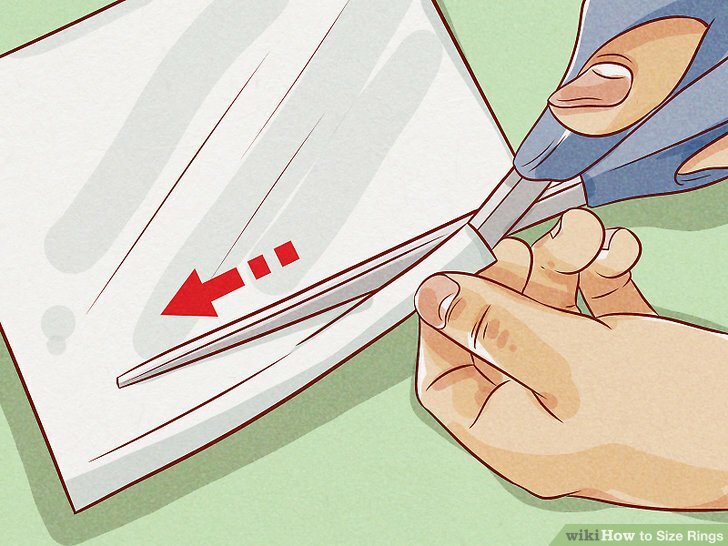 Carefully cut the paper to make a strip that is as long as possible. Make sure the strip is about the same width as the band of the ring that you want or slightly larger. It’s important to use sturdy paper, since other materials, like ribbon and string, can stretch and give you an inaccurate measurement. 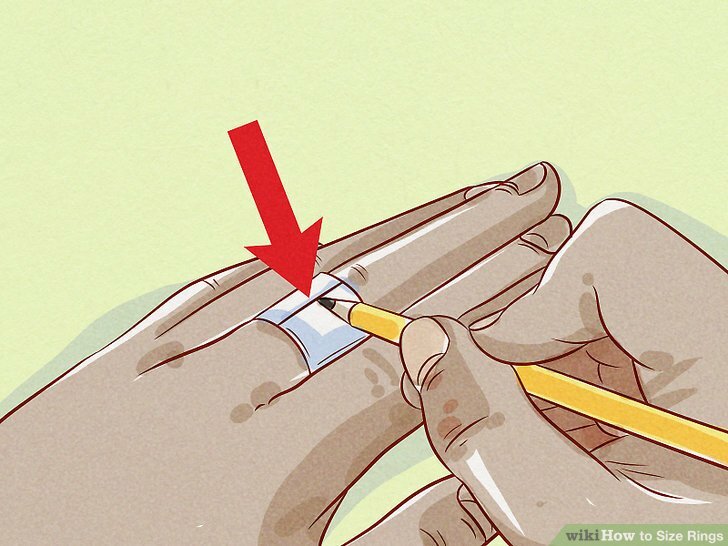 Wrap the paper around the widest part of your finger. Look at your finger to see where the widest part is, and wrap the paper once around that area. If your knuckle is the widest section of your finger, measure there so you can ensure that the ring will fit over it. Make sure the paper is snug, but don’t pull so tightly that it tears. If the paper does tear, simply cut a new strip and start over. 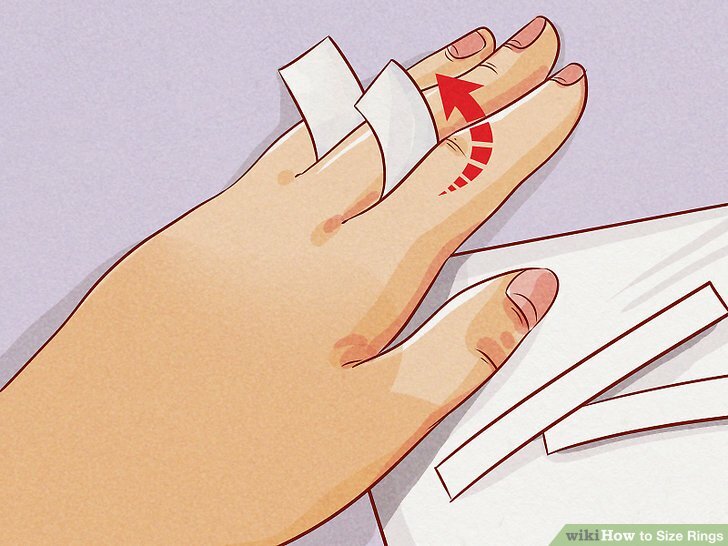 Mark where the piece of paper overlaps on your finger. Using a pen or pencil, draw a line on each part of the paper where it overlaps on your finger. You should have 2 lines that mark the circumference of your finger on the piece of paper. Flatten out the paper and measure the distance between the 2 lines. Unwrap the paper from your finger and flatten it as much as possible. 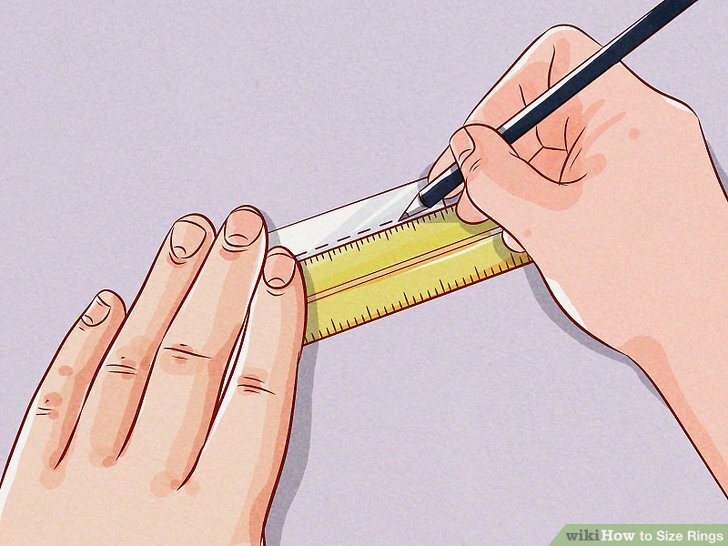 Then, use a ruler to measure the length between the 2 lines that you marked on the paper. Depending on where you live and the company that you’re purchasing from, you may need to measure in inches or millimeters. Consult a sizing chart to convert the measurement to a ring size. Look at a sizing chart online to see what size your measurement translate to. If possible, use the size chart that’s specific to the company that you’re purchasing from, since there can be slight variations in sizing between countries. 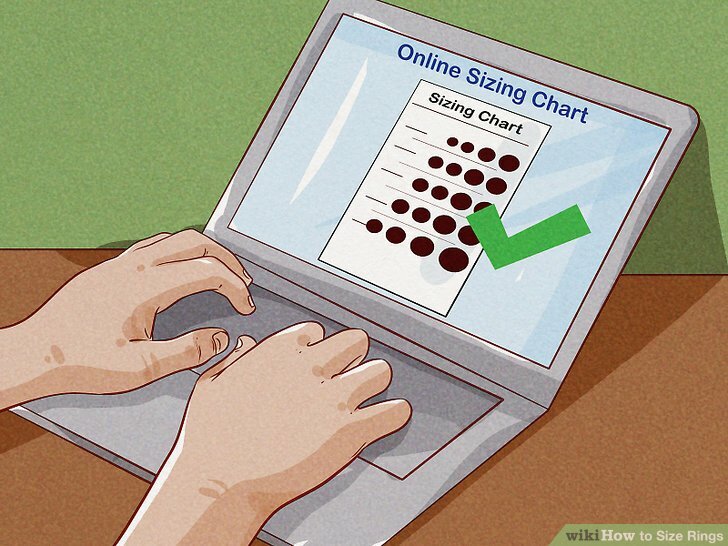 If the site doesn’t have a size chart, use a standard size chart to find your size. Keep in mind that rings can usually be resized to about 2 sizes smaller or larger if needed. 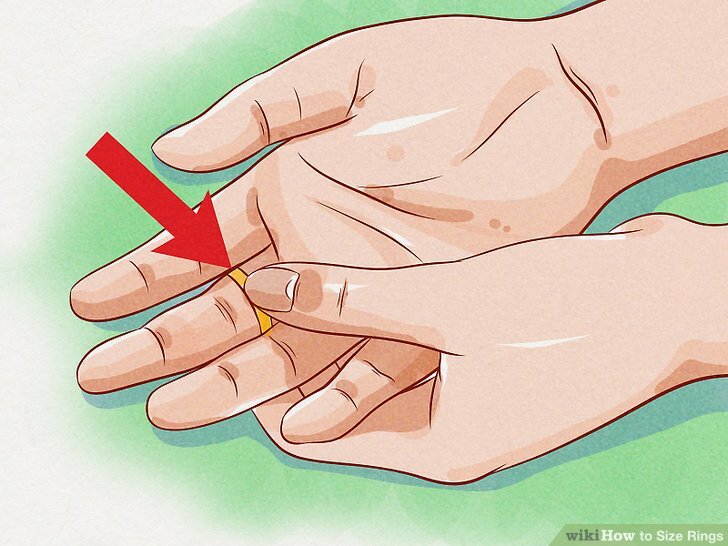 If you’re measuring your finger, try to do so toward the end of the day, since your fingers tend to be more swollen at that time. Mahhi-Jay to exchange rings soon?